RAJSHAHI: With grassroots farers reaping a sound profit, commercial farming of banana has been gaining ground in the region including its vast Barind tract, reports BSS. Currently, the banana is being adjudged as one of the cash crops here. Though the farmers were dissatisfied over market price of the crop last year they are very happy this year with the sale proceeds. 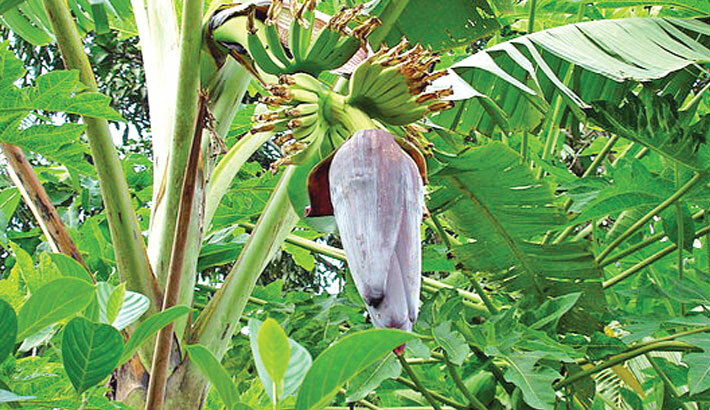 Mijanur Rahman, a farmer of Duary village under Paba upazila, said farmers are deriving a higher benefit from banana farming than any other crop. So, its farming is increasing side by side with other crops. Farmers cultivate varieties of banana like Anupam, Champa, Meher Sagar and Manik commercially as they can harvest these varieties within a lesser time. Sanwar Hossain, another banana farmer of Mohanpur, said banana cultivation was further profitable than any other plantation. Moreover, when the trees are small in size, some other crops can be cultivated on the same land as companion crops. The demand of banana remained the same all through the year and the price is also satisfactory. Monjurul Haque, district training officer of Department of Agriculture Extension (DAE), said banana is cultivated on comparatively high lands, free of waterlogging. Farmers in Bagmara, Tanore, Mohanpur, Durgapur and Paba upazilas dig ponds in their fields and cultivate banana on the enclosure of those ponds. He said this year banana was cultivated on more than 8,000 bighas of land than that of the last year. He said 300 to 350 banana plants can be transplanted on a bigha of land and it costs Tk 23,000 to Tk 25,000. There was no problem in selling banana because the whole sale traders purchased those from the field. At present, a huge supply of banana is seen in the markets of Baneswar, Jhalmolia of Puthia upazila, Mollapara and Baya of Paba upazila, Mougacchi and Keshorhat of Mohanpur upazilas. But Puthia upazila was topping the list in cultivating banana. Agriculturist Mustafizur Rahman, additional director of DAE, said banana cultivation is profitable. A good number of farmers in the district show their interest in banana production. Meanwhile, fruit bagging banana farming has been started here for the first time in order to make the cash crop farming hygienic and profitable. On a limited scale, Sujammel Haque and some of his fellows of neighbouring Birhasthail village under Paba upazila began banana farming in fruit bagging technology this year commercially. Sujammel earned extra money from mango farming through using the modern technology. Dr Alim Uddin, principal scientific officer of Fruit Research Station in Rajshahi, said banana is one of the commercially important fruit crops in the region, but the important cash crop is prone to attacks of insect pests and diseases in all stages of development. He told BSS that banana is one of the best fruits in Bangladesh. It’s tasty, easy accessible and nutritive. Fruit bagging technology is being widely used in commercial banana farming in many countries like the Philippines and Thailand. The country produces around 77.5 lakh metric tonnes of banana from 46,734 hectares of land every year. Rajshahi district contributes 35,000 metric tonnes from around 2,000 hectares of land. He opined that there are enormous scopes of promoting the technology in Rajshahi region and across the country as well. Diversified research activities are being carried out for production of best quality and spotless banana, he added.